One year after Tod Williams Billie Tsien Architects experienced the loss of one of its best-known buildings, the American Folk Art Museum in Manhattan, another of the firm’s high profile commissions is being considered for possible demolition, by its original owner. 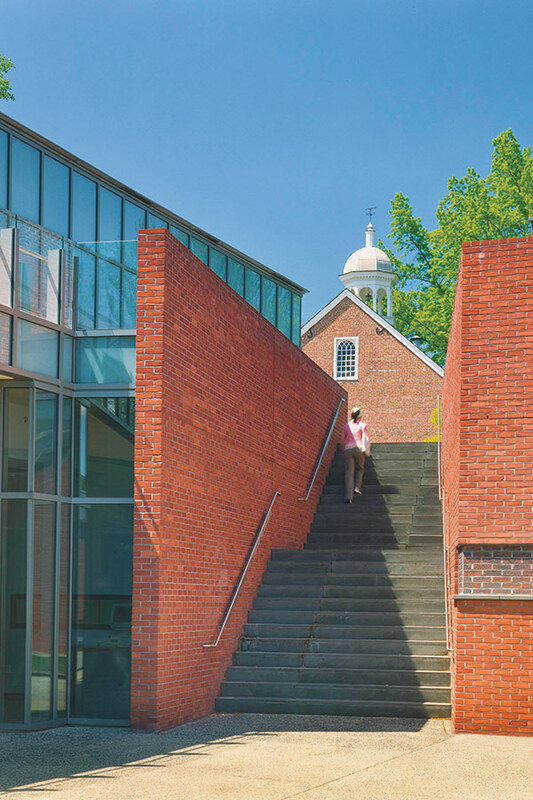 The Mattin Center, a $17 million, 50,000-square-foot arts complex opened in 2001 on the Johns Hopkins University’s Homewood campus in Baltimore, Maryland. 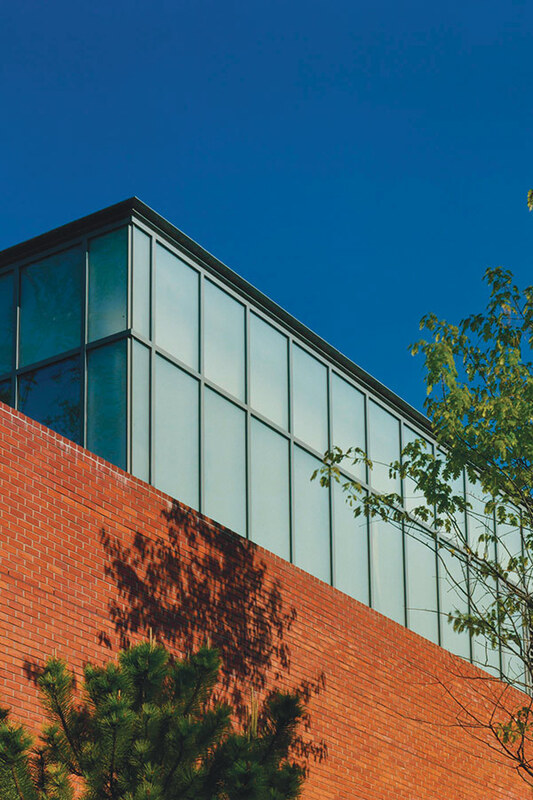 Named for a 1975 Hopkins graduate, Christina Mattin, who donated $7.5 million to help fund the project, the Mattin Center opened the same year as the American Folk Art Museum opened in Manhattan. 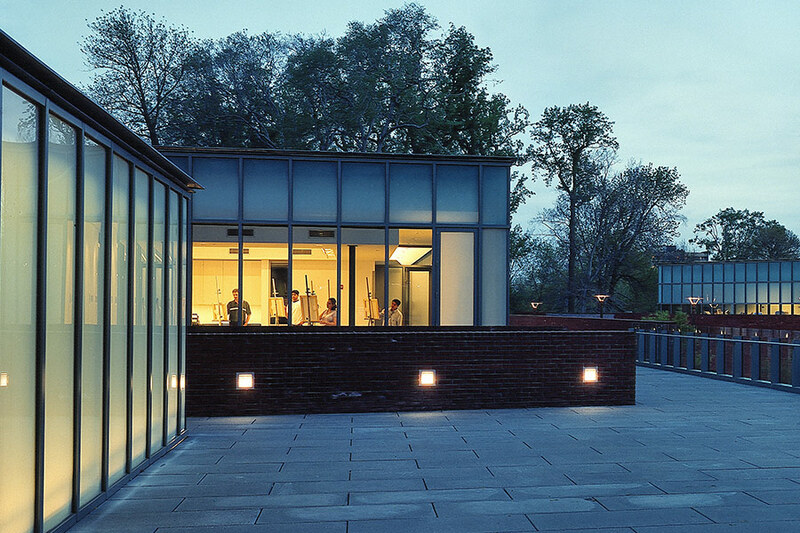 Hopkins built the Mattin Center to increase its extracurricular arts offerings for students, most of whom live on campus or nearby. Trustees selected a 1.5-acre site near the main entrance to campus, adjacent to the Baltimore Museum of Art, and visible from Charles Street, the city’s main north-south thoroughfare. They selected Williams and Tsien after considering other nationally prominent architects, including Bohlin Cywinski Jackson. 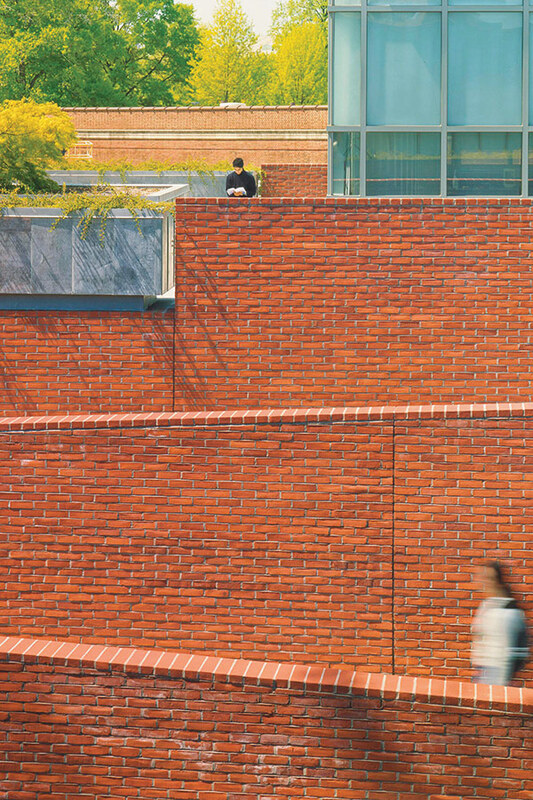 The Mattin Center consists of three brick-clad buildings framing an open courtyard and housing visual art and computer rooms, a dance studio, student offices, a black box theater, individual and group music practice rooms, and a café. Students go there in their free time to take non-accredited classes in dance, theater, and the visual arts. The center won a 2002 design award from the New York chapter of the American Institute of Architects. Fourteen years after the project opened, a different university president, Ron Daniels, has expressed a desire to do even more to enhance student life outside classes. Hopkins does not have a traditional student union the way many campuses do. One of the administration’s goals is to build a student union or campus center by 2020 to help improve student life outside classes. In 2014 Hopkins launched a feasibility study to help determine exactly where to build such a facility, which officials say could be one building or more than one building grouped in a student life “precinct,” near the heart of campus. The university also selected two firms to lead the study: Ann Beha Architects of Boston, to serve as architect, and Gustafson Guthrie Nichol of Seattle and Washington, D.C., to serve as landscape architect. A 2014 article about the project that appeared in the Johns Hopkins News-Letter after the university selected its design team also identified “the area in and around the Mattin Center and in the vicinity of the Brody Learning Commons” as “the focus of a broader ‘student union/campus center’ feasibility study.” The article said campus officials asked the designers to prepare “three basic options for the site, including rough cost estimates.” It said officials will be evaluating a range of possibilities, from razing existing buildings to modifying the Mattin Center and possibly enclosing the courtyard” defined by its three structures. In the News-Letter article, university architect Jim Miller indicated there is a strong likelihood that the Mattin Center would be altered to some degree. “At the end of the day, we can’t leave the Mattin Center exactly as it is and succeed,” Miller was quoted as saying. Dennis O’Shea, executive director for media relations and crisis communications at Hopkins, said in March that university officials did not want to discuss the project beyond the information they previously provided. In an email, he said the study is “on hold” at present but indicated that it will be “revved up” again to meet the president’s goals. “From our point of view, this wouldn’t be the time to talk about it,” O’Shea said in his message. Sandra Sparks, president of the Charles Village Civic Association, which represents the community that adjoins the Homewood campus closest to Mattin Center, said Hopkins officials have informed community leaders that the university has a new project in the works but that she has not been invited to attend any meetings about it. Sparks, who was involved in the planning for the Mattin Center, said she believes the Williams and Tsien buildings have not been successful from the community’s standpoint. She said the buildings were designed at a time when Hopkins planners wanted campus buildings to face inward and away from the neighboring community. Today, she said, the current administration has been making efforts to strengthen connections between the campus and surrounding neighborhoods, and its latest projects reflect that. Because it turns its back on the community and presents a wall to Charles Street, she said, Mattin Center reflects the planning philosophy of a previous administration and campus planners who are no longer making decisions at Hopkins. Newport Beach's central government complex emphasizes transparency, sustainability. 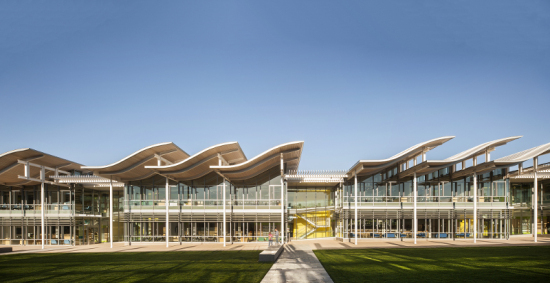 Bohlin Cywinski Jackson's (BCJ) Newport Beach Civic Center is in one sense classically Southern Californian. With its light steel structure, plentiful windows, emphasis on indoor-outdoor spaces, and roofline inspired by ocean waves, it evokes a timeless delight in Pacific coast living. But it also represents something new, both for the city of Newport Beach and for civic architecture more generally. Built on a marshy site that had previously been written off as uninhabitable, the LEED Gold Civic Center and adjacent 16-acre park, designed by BCJ in cooperation with PWP Landscape Architecture, acts as a different kind of anchor for the automobile-oriented community. "It was shaped in part by a desire to create a great public space," said principal in charge Greg Mottola. "How do you make an urban civic space in the context of the suburbs?" The architects choreographed the Civic Center's entry sequence to transition from highway speeds to the pedestrian scale. The freestanding Council Chambers sits at the entrance to the complex, its white Gore-tex fabric "sail" doing double duty as sunshade and visual trademark. "The sail was really a way to help people understand the Civic Center at 40 miles per hour," said project manager Steve Chaitow. "You turn in there, and as you slow down the scale of the project begins to become more fine-grained." Past the Council Chambers and neighboring community room is the long, low City Hall building, which upends the traditional emphasis on monumentality in favor of democracy. "One of the key issues was the metaphorical and literal transparency of government," said Chaitow. The focus on transparency is expressed both in City Hall's plan, which eschews a grand lobby in favor of outdoor circulation and separate entrances for each department, and its glass facade. To create a public front porch for the building, BCJ covered each bay with a curved roof composed of whitewashed hemlock soffit on a steel frame. The panels provide crucial shading for the east-facing curtain wall, which opens onto the Civic Green. "That roof overhang is 20-30 feet, it's really out there," said Chaitow. "That's what allowed us to have this facade of glass and not pay a penalty." Custom horizontal aluminum louvers on the curtain wall's lower level furnish additional protection against thermal gain. The architects worked with Arup to study the structure blade by blade, to maximize shading without sacrificing visibility. The aluminum extrusions were also designed to stand off the curtain wall, to facilitate window washing. For ventilation, BCJ installed operable clerestory windows between each pair of roof panels. The windows run on an automated system and let in an even northern light that often negates the need for artificial lighting. "A big pull for the client and for us was to try to make this building responsive to its location," said Mottola. "It's been a pretty successful change for them as far as changing the culture at City Hall." Vertical aluminum louvers over City Hall's clerestory windows and other north-facing glazing prevent interior lights from disturbing the neighbors at night. The back-of-house spaces, including conference rooms and patios for staff, are gathered along an open circulation path along the west side of the building. The emphasis on common space prompted the mayor to remark, "I have met more of our City Staff in two weeks here than I did in seven years in our old city hall." Two of the Civic Center's other structures, the Council Chambers and community room, which both feature large sliding glass doors, are partially clad in stone. "We wanted to use some stone because it has a nice relationship to the concept of civic building, but we wanted to use it selectively," said Mottola. Brazilian marble was used on portions of the Council Chambers envelope, while the community room is wrapped in French limestone. The slightly darker French limestone serves to make the community room more recessive, highlighting the Council Chambers. At the same time, the location of the community room within the Civic Center as a whole reveals that it may be the complex's most important building. "The first project you see as you slow down when entering the Civic Center is the city's 'living room,'" said Chaitow. "That's intentional. Symbolically, it was important as a gesture about twenty-first century democracy." 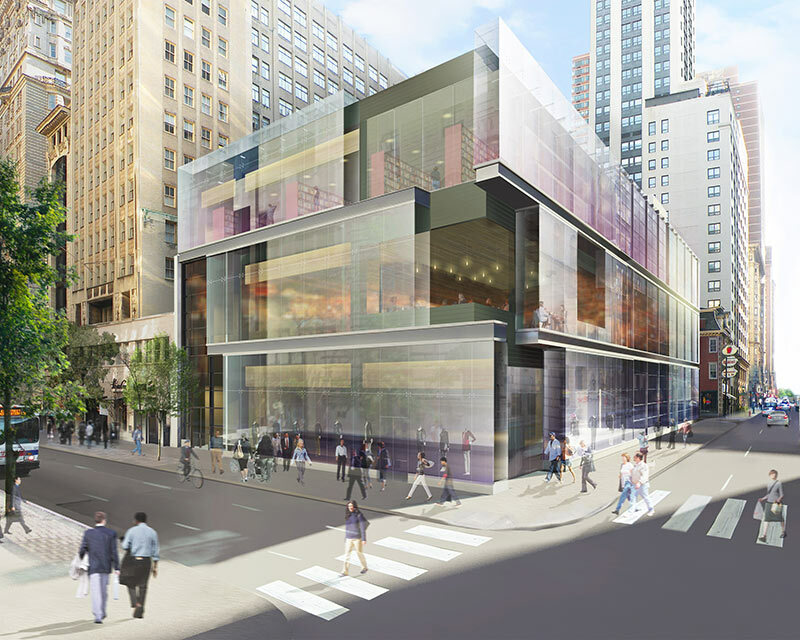 The architectural firm behind Apple’s famous crystalline cube on Fifth Avenue has designed a dynamic glass retail structure in downtown Philadelphia at the intersection of 15th and Walnut streets. After studying various massing configurations that would allow tenants to customize their own identity without compromising the overall building appearance, Bohlin Cywinski Jackson (BCJ) devised a three-story structure with enough visual weight to hold its own among the masonry architecture of Center City. “We evolved into a horizontal layering effect on the facade to give the appearance that the walls could slide,” said Andrew Moroz, associate at BCJ. 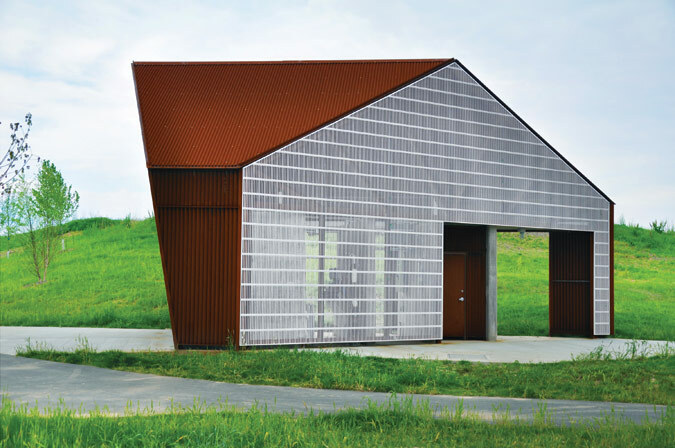 Since solar heat gain is not an issue on the well-shaded, north-facing site, the architects were able to use ultra-clear low-iron glass. The material allows the steel structure to show through. Though it’s only three stories, with twenty-foot floor-to-floor heights the building reaches 65 feet tall. 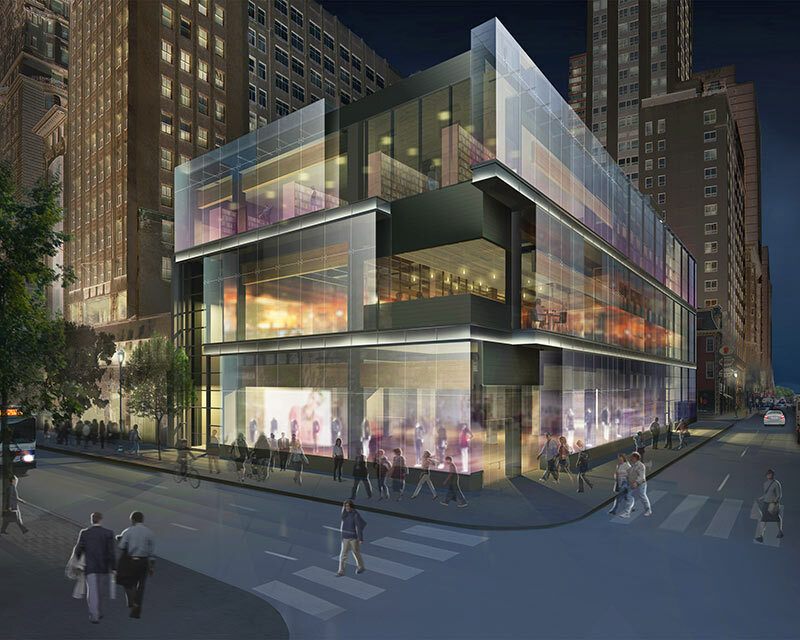 The structurally-glazed horizontal layers help to emphasize the building’s corner, where a second-story open terrace will be built for the unlikely anchor tenant of this sleek modern building: The Cheesecake Factory. Philadelphia’s new stormwater regulations stipulate that the structure must retain 20 percent of the rainwater that hits its roof. The architects employed a mix of green and blue roof technologies that could later be partially occupied, depending on tenant fit-outs. Moroz said site demolition will begin this spring followed by a 14-month construction period. 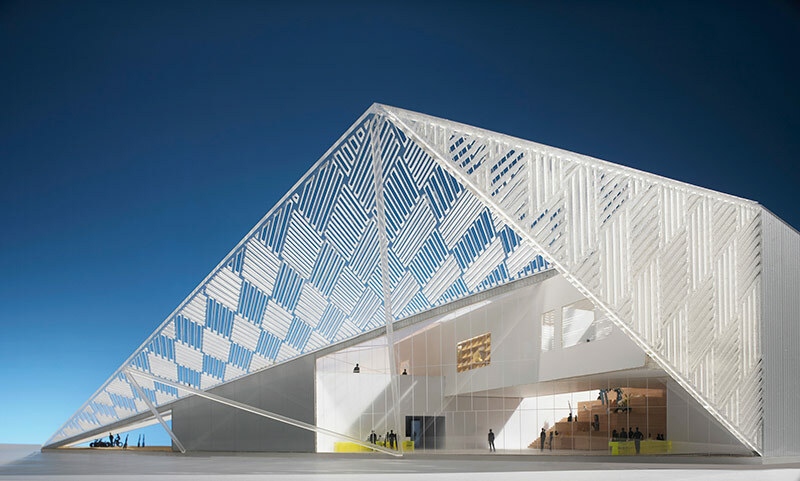 Last month AN reported that UC Davis had selected a shortlist for its Jan Shrem and Maria Manetti Shrem Museum of Art. Well we have a winner: "Grand Canopy," by So - IL / Bohlin Cywinski Jackson/ Whiting-Turner. The design features a 50,000 square-foot floating steel canopy which weaves together exterior and interior space for galleries, exhibitions, concerts, art studios, as well as artists' residencies. 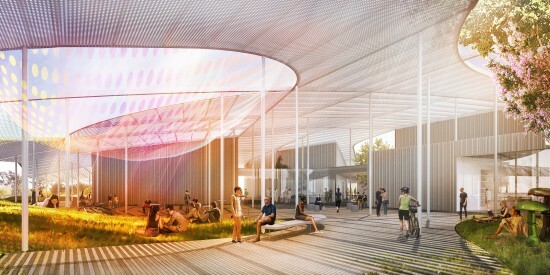 Jurors selected the design from a shortlist of three finalists for its unusual incorporation of light, close connection to the UC Davis campus, as well as the ability to adapt and grow over time to the changing needs of its users--the students, faculty, staff, and visitors. 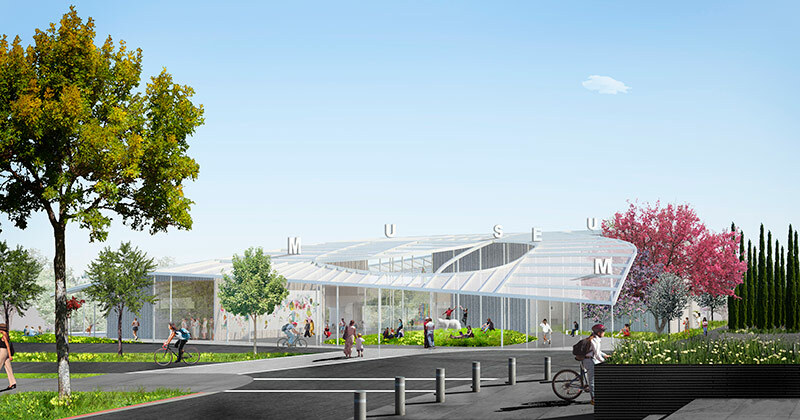 The museum will occupy 1.6 acres on the southern edge of the UC Davis campus.Watch Florian Idenburg, design architect and partner for SO - IL, talk about the winning design (Joe Proudman/UC Davis). 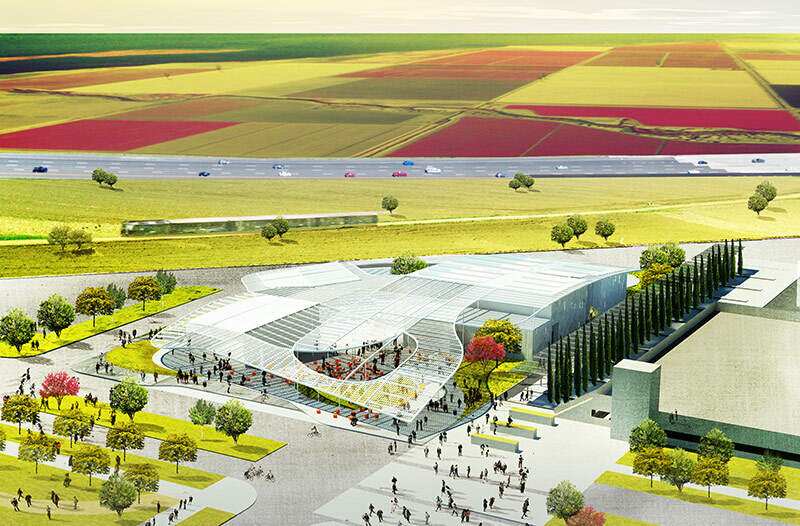 SO-IL's proposal for a new UC Davis museum. In the course of more than 40 years, the University of California, Davis has amassed a fine art collection of more than 4,000 works, from ceramics to paintings, spanning antiquity to the present. While the collection is visible online, much of it has remained in archival storage. University administrators, staff, and faculty have wrestled with a method for improving access for students and the wider community. Now the school is planning a fine arts museum on campus that will serve as an art and architecture learning tool. To attract proposals for the project—which is to be called The Jan Shrem and Maria Manetti Shrem Museum of Art—the school hosted an international design competition with a twist. 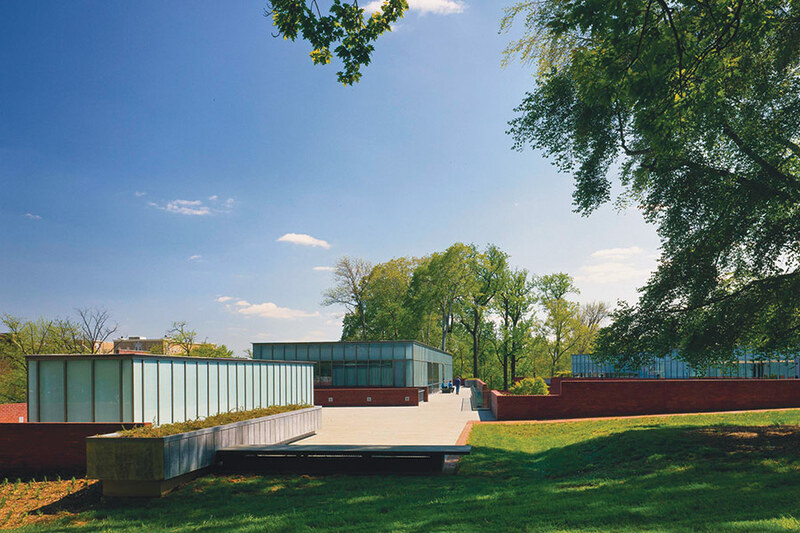 It gave entrants four months to design and bid, with teams consisting of not only an architecture firm, but an executive architect and a contractor as well—design-build collaborations that may be a first for a fine arts museum in the U.S. The three finalist designs come from bi-coastal and international teams with diverse strategies for the museum, which will occupy 1.6 acres on the southern edge of the UC Davis campus. Entries were judged on a variety of criteria, including previous exhibition design experience, familiarity with the university, creativity, and an innovative sustainable design approach. The Slant—by Kitchell/WORKac/WRC—centers on providing public access through a variety of indoor spaces as well as outdoor “rooms” for public programming. The orientation and angle of the sloped roof is calculated to minimize solar heat gain without sacrificing views to the outside. The name of The Leaf—by Oliver and Company/Henning Larsen Architects/Gould Evans—refers to its foliage-shaped roof canopy. The design features a covered ramp that connects the ground level to an upper story courtyard, where circulation doubles as a living room. Grand Canopy—by Whiting-Turner/SO - IL/Bohlin Cywinski Jackson—imagines a 50,000-square-foot permeable cover, with spaces to host outdoor art events, concerts, and classes. Funding for the project will come from tax-exempt bonds as well as private donations. The museum is named after Jan Shrem, a Napa Valley wine proprietor and his wife, Maria Manetti Shrem, an arts patron, who together donated $10 million toward the facility’s construction. After a period of public input, the winning design will be announced mid May. Groundbreaking is anticipated for 2014 and completion in 2016. Three design-build teams have been shortlisted to design the $30 million Jan Shrem and Maria Manetti Shrem Museum of Art at the University of California, Davis. They are: WORKac and Westlake Reed Leskosky with Kitchell; Henning Larsen Architects and Gould Evans with Oliver and Co; and SO–IL and Bohlin Cywinski Jackson with Whiting-Turner. Each team had four months to prepare a bid for the museum. The museum will be named after Jan Shrem, operator of Clos Pegase winery in the Napa Valley, and his wife Maria Manetti Shrem. It all started with a beech tree that has lived for the past hundred years on the Colombiere Jesuit Brother’s bucolic 14-acre site in Baltimore, MD. 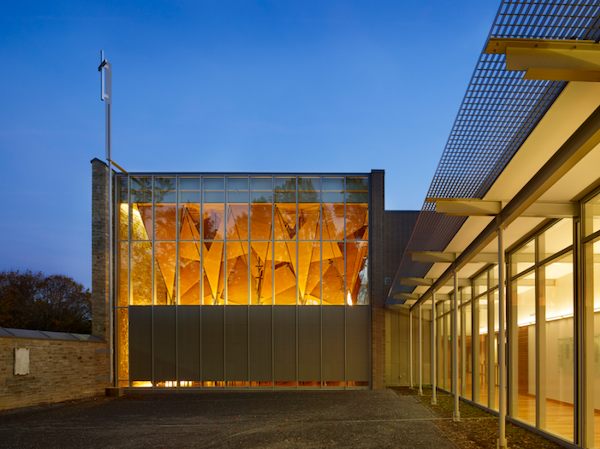 The tree stands in plain view of the brothers’ new chapel, designed by Bohlin Cywinski Jackson (BCJ). Alfred Dragani, an associate with the firm and the lead on the project, said that “as our Jesuit clients expressed a greater desire for privacy, we began to study ways of designing a shroud behind the south and north facing glass walls of the chapel that would operate like light-modulating screens. Our hope was that we could simulate the effect of an actual tree canopy, resulting in a dappled and serene light.” Dragani and his team used digital modeling (Rhino and Grasshopper) to simulate daylight conditions in the chapel throughout the year and create an interior installation in the chapel made from perforated wood panels in an organic arrangement of overlapping planes within a repetitive steel framework. White Ash and ¾” thick Baltic birch plywood core panels of varying sizes and configurations were used for the “leaves.” Perforation with a ⅜” diameter spaced 1” on center were made using a CNC machine in order to give the wood panels a “diaphanous quality.” There are 95 panels in all, 48 on the south face and 47 on the north. They average 60 pounds apiece, though some are as heavy as 150 pounds. BCJ handed off their Rhino model to Amuneal, a metals manufacturer, who used it to develop a steel plate canopy armature that consisted of built-up sections of laser cut ¾” x 4” carbon steel plate bolted together to hold the 6,000+ pounds of wood. To install the wood and steel structure in the three-story high chapel ceiling (29’ 5” high), all the components were shipped and erected onsite. 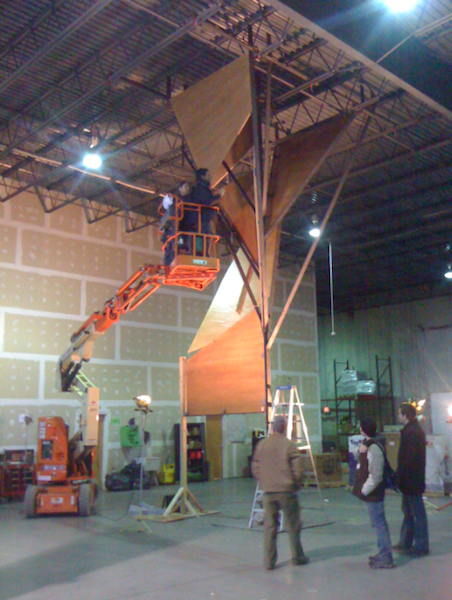 To make sure the installation would go smoothly, Dragani said that before “the final erection of the canopies, a full-scale mockup was built off site, reviewed by the project team and used to refine erection techniques and detailing.” The crucial part of this design is the delicate layering effect achieved with six tons of wood and steel. 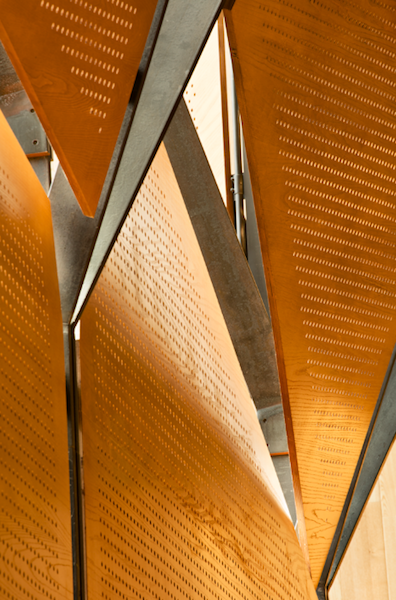 Dragani explained how assembling “the perforated panels at various angles generates a luminous field that approaches what one might experience when viewing light as it is passes through a natural tree canopy. Moments of direct light that permeate through larger apertures between panels are constantly changing and serve to animate the perforated wood shroud and the chapel floor and walls over the course of a day. 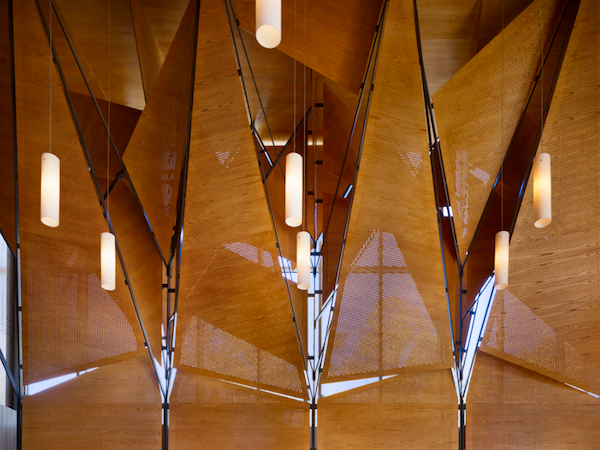 The grain/direction of the perforations is always perpendicular to each panel’s longest edge, which helps to recall the metaphor of natural foliage.” Even though sound-proofing wasn’t one of their goals BCJ expected the perforated wood panels to have an acoustic impact on the space. A computer model showed that they didn’t improve the acoustic performance whatsoever. Still, the architectural canopy is not only structurally impressive, it also evokes the serene outdoor environment in an interior space. The brothers agree. 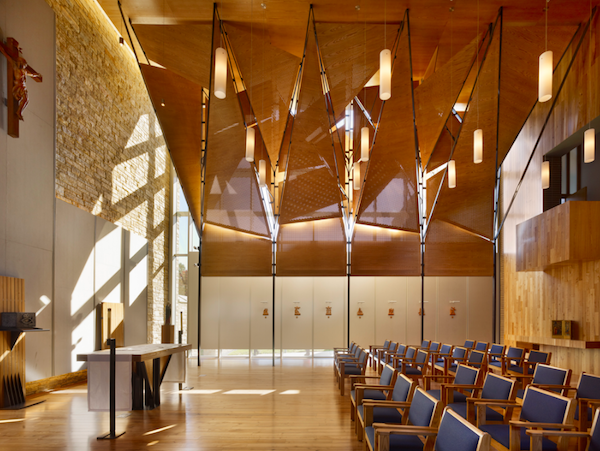 While the non-traditional form of the chapel and even the tree canopy itself seems to have taken the Jesuit brothers by surprise, they appreciate how the presence of the canopy lends the chapel sanctuary a sense of sublime light and a state of repose appropriate to a place of worship. In an ever more interconnected and globalized world, the concept of regionalism seems both out of step and more relevant than ever. And the architects associated with an architecture of place are keenly aware that—whatever the wider world thinks—their work is not based on a menu of fixed typologies but on adaptive values. Regionalism today is not about quoting barns and silo-shaped houses but rather actively engaging with the deeper forces driving specifics of form—whether it’s time, culture, climate or cost. Critic David D'Arcy reexamines Kenneth Frampton's canonical essay on Critical Regionalism with fresh eyes, while AN editors survey projects and practitioners that are carving out new principles as they engage with—or resist—the notion of regionalism. This was the condition, not just of the built environment, but of architecture, said Kenneth Frampton, who accused architects of responding with eclectic historical nostalgia and a rapturous futurism. And it was only 1983. Frampton’s response was a jeremiad deploring it all. And there was much to deplore. 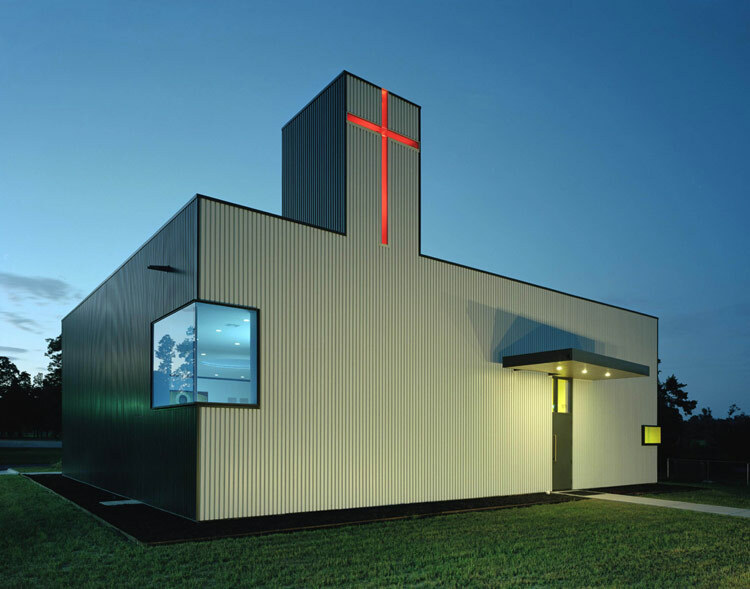 St. Nicholas Eastern Orthodox Church, Springdale, AR, Marlon Blackwell Architect. Frampton’s enemy then was post-modernism. He and others felt besieged by a tendency that was dragging critics and resources and young talent into nostalgia or into technological rootlessness. Back in the 1980s, Frampton and others would foresee another persistent factor. This regionalizing trend that they hoped for would not be a revolution. “The scope of activity available to the potential regionalist is interstitial rather than global in nature,” Frampton wrote in 1988, “which will be seen to some as a deciding advantage.” Frampton also called that work marginal—not the most effective term for recruiting. Nakahouse, Hollywood Hills, CA, Xten Architecture. It’s now clear that Frampton under-estimated the challenge—and the flexible advantage of regionalism. It was several financial crashes ago, before the Internet enabled almost everything besides dwelling to be virtual rather than tactile, and before destination architecture turned a battleground like Bilbao into a tourist mecca and turned an elite of architects into boldfaced names. Some three decades later, regional architecture is a sensibility, rather than a movement. Like most tendencies that move from the bottom up, there are no clear rules, other than a tactility, a commitment to place, and an ethical attitude about community, all of which fuse into an approach to sustainability, a term that escaped the earliest formulations. In a 2006 lecture, Alexander Tzonis updated the challenge: “Mindlessly adopting narcissistic dogmas in the name of universality leads to environments that are economically costly, ecologically destructive, and catastrophic to the human community.” As Yogi Berra might have said, it’s apocalypse all over again. 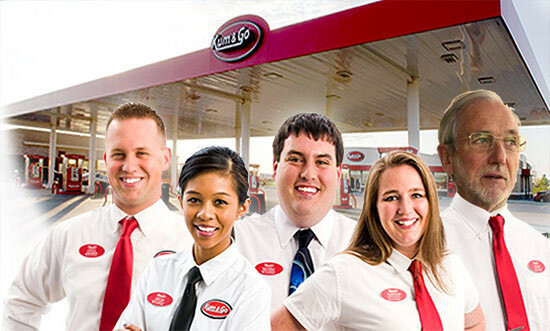 Like anything regional, solutions will vary from location to location. These are paths that lead to hybridization, rather than purity. Weekend House, North Shore, Lake Superior, Julie Snow Architects. No surprise, it’s leaderless. But there are plenty of prophets, like Alvar Aalto, whose brick Synatsalo Town Hall of 1952 was a triumph of tactility for Frampton. Another one of Frampton’s heroes was Luis Barragán, whose 1947–48 Casa Estudio—an office, home, and garden in Tacubaya, a working-class suburb of Mexico City—is now being scrutinized in a new documentary by Rax Rinnekangas and the Finnish architect and critic Juhani Pallasmaa. And adherents are growing, hailing from farther afield both, in geographical and intellectual reach. In Nova Scotia, architect Brian MacKay-Lyons has been gathering architects—under the suitably oblique banner Ghost—to appraise the future of master building in terms of landscape, material culture, and community. Both Frampton and Pallasmaa have contributed but the range of engaged architects is wide, among them Deborah Berke, Wendell Burnette, Ted Flato, Vincent James, Rick Joy, Richard Kroeker, Tom Kundig, Patricia Patkau, Dan Rockhill, and Brigitte Shim. 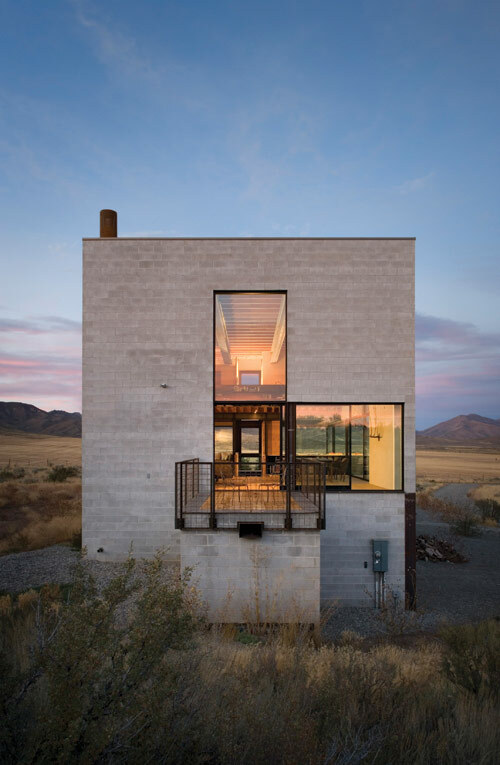 Among them is Marlon Blackwell, who is all too keenly aware that he has been scripted as American architecture’s regional everyman. Based in Fayetteville, Arkansas, he has developed an approach as likely to draw on mud towers in Yemen as the state’s ubiquitous long-haul trucks. For the Porchdog House, a post-Katrina dwelling, Blackwell rejected a retreat to the sentimental vernacular. Instead of a granny-style porch with geraniums and rockers, the Biloxi house sits on 11-foot pillars—a new prototype responsive to the elements, but also affordable enough to replicate. 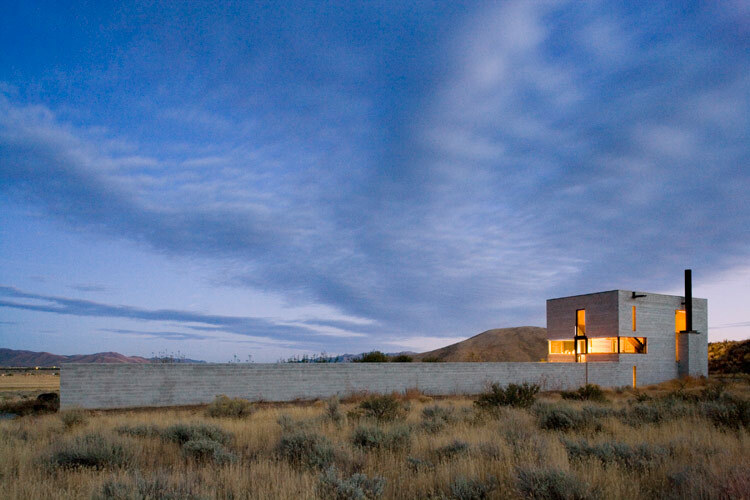 Outpost, CentralIdaho, Olson Kundig Architects. 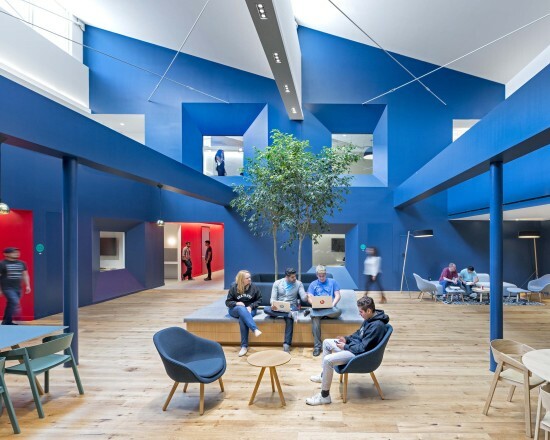 Blending the mass-production possibilities of the prototype with locally resonant design defines a hybrid approach being taken by regional firms like Bohlin Cywinski Jackson, designers of the Apple Store. The product is a paradox—multiple corporate retail stores are also transparent physical gathering places for corporeal Apple customers who spend much of their time in virtual worlds. The stores are potent advertising logos, as well as local destinations. Is this a case of regionalists already jumping ship or selling out? Only if the already-slippery definition of regionalism is seen as a rigid pledge or a straitjacket, which hasn’t been suggested by any architect. There is no required vow of poverty, chastity, or obedience. So far, no one has been excommunicated from Ghost for taking on corporate clients. Or for creating a destination. And what, if not a destination, is the new and exquisite Clyfford Still Museum in Denver, a gambit hyped as a tourist site by destination-obsessed Denver and designed by Brad Cloepfil, a Frampton pupil at Columbia University who established himself as a practitioner of Pacific Northwest regionalism? Rather than create another billboard for the city, Cloepfil responded with a restrained design at a restrained budget. If the Clyfford Still Museum says anything about regionalist work, it is that it can be purposefully local without aesthetic compromise. As regional work once thought destined for the interstices surges through the cracks, consider the food analogy. Declining quality, rising cost, and waste alarmed a small core of eco-minded consumers and producers, and spawned the locavore movement. Some three decades later, it has bastions throughout North America and Europe and beyond. Restaurants and producers have lifted local economies, which continue to grow, benefiting everyone from architects to sommeliers (and throwing off profitable vernacular subsections). With architecture, as with food, the challenge is to move beyond the elite clients, and into the regionalists’ heartland, where the vernaculars of poor nutrition and cheap generic construction meet at the strip mall and sprawl outward. [Editor's Note: Following the unveiling of proposals to redesign the National Mall, AN will be running a three-part series to display the proposals for each of the three segments of the Mall: Constitution Gardens, Union Square, and the Washington Monument Grounds.] A 50-acre parcel of the National Mall, Constitution Gardens, lies just north of the Reflecting Pool and east of the Vietnam Veterans Memorial. Grade changes keep it somewhat hidden from the main stretch of the Mall, and many tourists (and locals) visit the monuments and Smithsonian museums without coming across it. The gardens' focal point is a small lake with an island that visitors can access by footbridge. The National Park Service has struggled with the site's poor soil conditions—the ground was dredged from the Potomac River back in the late 19th century—and with upkeep of the paths and other features. The National Mall Plan of 2010 calls for an "architecturally unique, multipurpose visitor facility, including food service, retail, and restrooms" to be developed at the east end of the lake, as well as a flexible performance space. Andropogon + Bohlin Cywinski Jackson propose a "resilient park landscape...sustained by biologically enhanced soils." 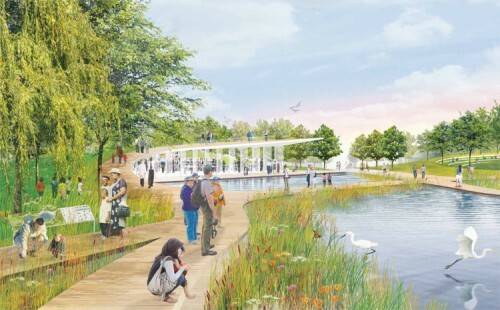 Their design includes a Magnolia Bog in part of the current lake area and different edges for the lake (lakeside promenade, wetlands boardwalk, rock outcropping). The team envisions a marketplace along Constitution Avenue. The concept submitted by Nelson Byrd Woltz Landscape Architect + Paul Murdoch Architects features a cafe built into the parkland near Constitution Avenue, the ground seemingly tilting up to form its green roof. This scheme also proposes boardwalks, performance seating, and biodiverse plantings. In OLIN + Weiss/Manfredi's plan, distinctive braided pathways curve around and over the water. Interlaced pavilions would house a cafe and a more formal restaurant, as well as a gift shop. Spectators at the outdoor amphitheater would be entertained by performers on a floating barge. Rogers Marvel Architects + Peter Walker and Partners call for a large restaurant/pavilion to face a reflecting basin that would allow ice skating in the winter and model boating in the summer. Paths would be widened and, at the lakeshore, bordered by an aquatic shelf for filtration; connections with other parts of the Mall would be improved. Click on a thumbnail to launch the slideshow. All images courtesy respective firms.